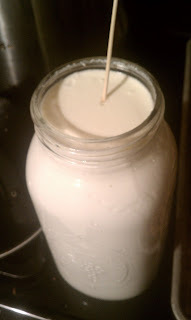 that's an odd way to start a post about how I love to spend all day making homemade yogurt. But it's true. It always seemed like fake dessert to me. Like you're supposed to open the little carton and take a bite of the stuff that's overly sweetened (probably to cover up the overly tangy flavor of the yogurt itself), and feel like you're eating something naughty, all the while knowing full well that this is the stuff of the beans and granola set. I just didn't like it. I used to be a cashier at a grocery store, and there was this one lady who used to come in every Friday after work. She worked at Brandywine, the now defunct fancy schmancy restaurant across the street from Polly's Supermarket. She would pull out her enormous wad of $1 bills from tips, and pay for a mountain of yogurt cups. That was all she ever bought. I can't even imagine. The only yogurt I ever remember liking was Yoplait breakfast yogurt. It was so good. I guess it might be because I wasn't expecting it to taste like Boston cream or Key lime pie. It just was what it was. And there was stuff in it. I like chewy stuff. And this yogurt had softened wheat berries and partially rehydrated dried apples, and it was lightly sweetened and flavored with cinnamon. Of course, they discontinued it years ago. Oh well. I have tried a couple of times to recreate it, but no luck so far. I'll let you know when I get there. The only other reasons, in my mind, to buy yogurt were for baking (it's the best for muffins!) and tzatziki, the yummy cucumber sauce that comes on your gyro. Of course, for tzatziki, you need the thicker Greek yogurt. I first made it several years ago, when the only place you could get Greek yogurt was at Mediterranean Island, the fantastic import grocery store in Kentwood. The last few years, though, it's become all the rage. And wow, has the price gone up! Well, a couple of years ago, a friend from college posted on Facebook that she was making yogurt. I was intrigued. Not because I wanted yogurt, but because making stuff that you didn't really think you could make at home is fun. It's like speaking truth to power. "Hey hey! Ho ho! 5 Buck per cup yogurt has got to go!" But then she posted about how good it tasted. I scoffed inwardly. This was yogurt she was writing about, after all. But she persisted in describing her late night snack of yogurt and peaches....or something like that....and I finally relented. Actually, I was already in the process of figuring out how to make homemade mozzarella cheese, but this looked way easier, so I jumped in. I still haven't made the cheese. I was still a little nervous, and watched lots of youtube videos and read lots of tutorials. I sanitized everything that would come within 5 inches of the yogurt at any time within the entire day long process. I tread very, very carefully. Somehow, leaving milk out of the fridge all day wasn't naturally followed by, "Hey, let's dig in!" Never the less, I plunged ahead. Turns out, making yogurt is very uncomplicated! And good grief, it is good. Yes, it's tangy, but in a good way. And I don't even sweeten it until I am ready to eat it. That makes it more versatile and suitable for many moods and uses. I prefer the thicker Greek-style yogurt for snacks, but we use regular yogurt for smoothies and baking. For the kids, I can mix in a little jelly or jell-o powder, which add sweetness, flavor, and color. There are lots of methods for making yogurt. You can google others if you like. You can use a little plain, store-bought yogurt as your starter, or, as I do, use freeze dried culture. To incubate the yogurt, you can use a thermos, a heating pad, or an appliance made just for this purpose. Or, as I do, use a warm water bath. Let me show you what works for me. To prepare your tools, first run the spoon, ladle, measuring cup, funnel, smaller pot and jars through the dishwasher hot rinse cycle. 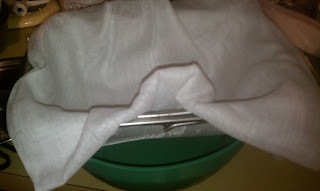 If you don't have a dishwasher, boil water in the smaller pot and just dip the other tools into the water to sanitize. Once you are done sanitizing the tools, pour the hot water into the larger pot and use the now-empty pot to warm your milk in. Place your kitchen towel on the counter next to your stove, covered by a paper towel, and lay your sanitized utensils on it. If that sounded complicated, I promise it's not. It's just a matter of gathering stuff and making sure it's clean. Now, it's time to start making yogurt. Pour your milk into the smaller pot. Again, I make a gallon at a time. But you can just make a quart if you want. But however much yogurt you want, you just use the equal amount of milk. You can use anything from skim milk to whole milk, but don't use the ultra-pasteurized milk. Most milk that you get at the supermarket is just fine. If it is ultra-pasteurized, it will say so on the label. Turn the heat on about medium high until the chill is off the milk. If you start on low, I swear it will take half your day just to get the milk warm. So start a little higher, and occasionally stir it, scraping the bottom to make sure that nothing is scorching. Test the temperature often. Any accurate thermometer will work. Once you hit about 120 degrees, turn the heat down to medium low and stir more often. Once you hit about 160 degrees, be ready to stay by the stove, stirring gently and constantly, and monitoring the temperature very often. You want the milk to come to between 180 and 185 degrees. Again, scrape the bottom of the pot to prevent scorching. However, I will add that, if you walked away for just a little too long, and you feel that some scorching has taken place, don't scrape. It only means that you will have to clean the pan a little more later on. You don't want those solids to end up in your yogurt, so just turn the heat down and try to keep the rest of the milk moving. 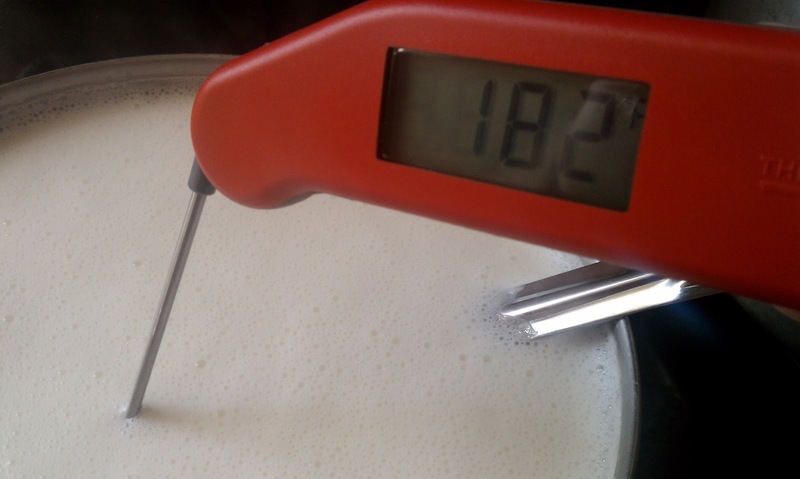 Once the milk reaches 180 degrees, it's time to cool it back down. You can just leave it to cool, stirring occasionally to help prevent a skin from forming. However, at this point, I have been waiting long enough, and I like to speed up the process. Put the stopper in your kitchen sink and fill it a little way with water. Lower the pot of hot milk into the sink, making sure that the water level stays below the level of the milk. If the water level is above the level of the pot's contents, the pot will float and become unstable, which will make you sad. If you overfilled the sink, just hold the pot steady with one hand, and pull the stopper with the other, until the water level is where it needs to be. Once the pot is stable in the sink, get your ice cubes or ice packs out of the freezer and drop them gently into the water. 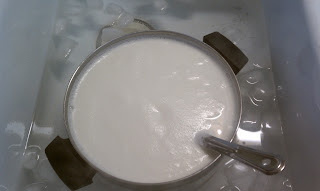 Surrounded by the ice bath, the milk will cool more quickly, and even more so if you continue to gently stir. At this point, you want to get your starter ready. 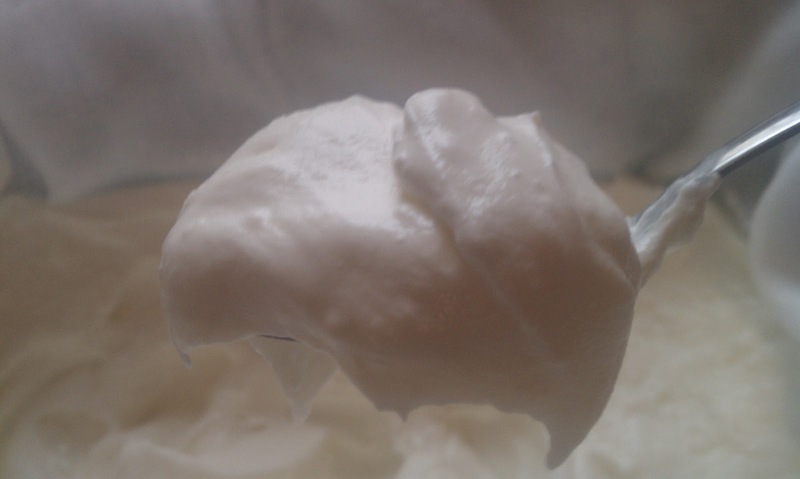 Like I said, you can use a couple of tablespoons of plain store-bought yogurt. I like to use freeze-dried culture. The reason for this is because I like the bacteria that is in Activia, but Activia doesn't sell a plain yogurt. 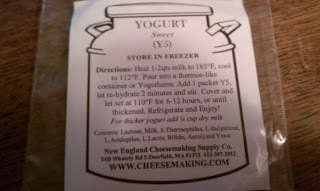 I found the right bacteria in the New England Cheesemaking Supply Co.'s Sweet Yogurt (Y5) starter. It's the bifido bacteria that I am looking for. But if you don't care about that, feel free to pick up a small carton of Dannon. You will also need your ladle and measuring cup soon, so have them ready. 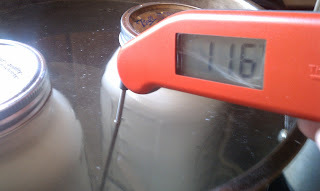 Keep monitoring the temperature of the milk. 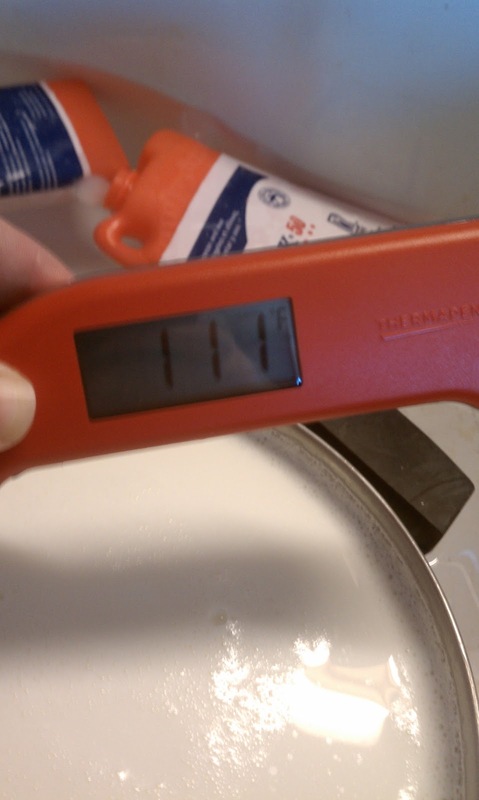 You want it to get below 120 degrees (anything higher would kill the bacteria), but not below 110 degrees. I waited a little long here. I prefer to get things going at 115 degrees. Remove the pot from the ice water to slow the cooling. Ladle out a little of the warm milk into the measuring cup, and add the starter, whether dry culture or plain yogurt. Stir it around a little to dissolve, then pour the combination back into the pot of milk and stir to combine. Now you can ladle the mixture into your jars. 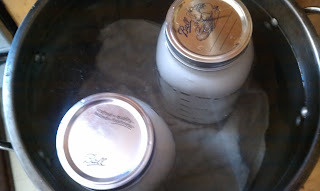 Again, I use canning jars because they are a convenient shape, they seal well, and I have them. Line the bottom of your larger pot with the kitchen towel, then fill it partway with water that is about 115 degrees. Tap water is fine. If you sanitized your tools with boiling water, you have a head start. Just add water until the temperature is around 115. Then lower the jars into the pot. You want the water to almost cover the jars. Place the lid on the pot. Now you can walk away for a while. For the rest of the day, the bacteria is going to be multiplying and turning your milk into yogurt. It's that simple. All you need to do is occasionally monitor the temperature of the water to make sure that it is staying above 100 degrees. If it gets below 110, I turn the burner on under the pot, but at its lowest possible setting. 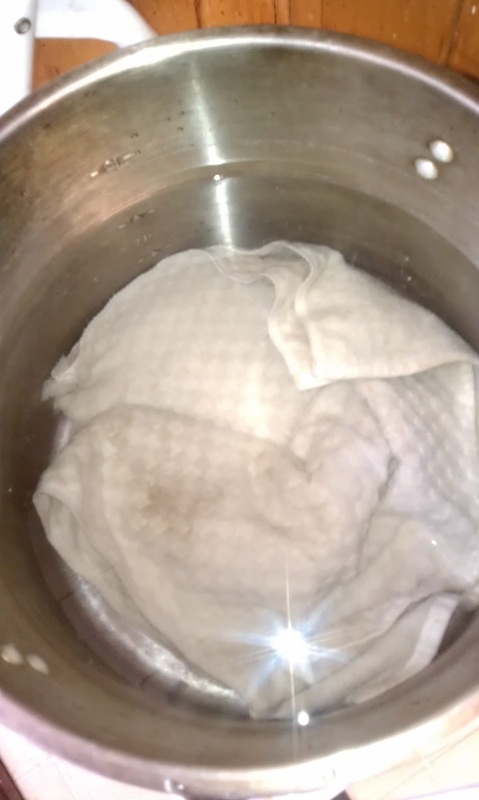 With the towel in the bottom, this will create a very slow and gentle heat that will warm the water back up. I usually only have to do this 2-3 times in a 12 hour incubation. With all the methods out there, why do I choose the warm water bath? Well, I refuse to buy a Yogotherm, which is a unitasking kitchen tool. The only thermos that I have was used solely for coffee for many years, and it smells like it. I don't have a pilot light in my oven, and my heating pad has an auto-off feature. I find other methods that I have read about to just be cumbersome. The hardest part of the water bath method is getting the water to the right temperature. And that's not hard at all. The water and the jars of yogurt are at approximately the same temperature, and they seem to keep each other that way, as long as the cover stays on the pot. I've been amazed at how long the water stays warm enough. In fact, if you want to be even less hands-on, you can place the pot into a turned-off oven with the light on. I did that once, and I think I only had to warm the oven (again, at its lowest setting) once in 12 hours. Being in the oven keeps drafts away, and the little bit of heat that the lightbulb produces really seems to help. As far as incubation time goes, you will want to experiment a bit. 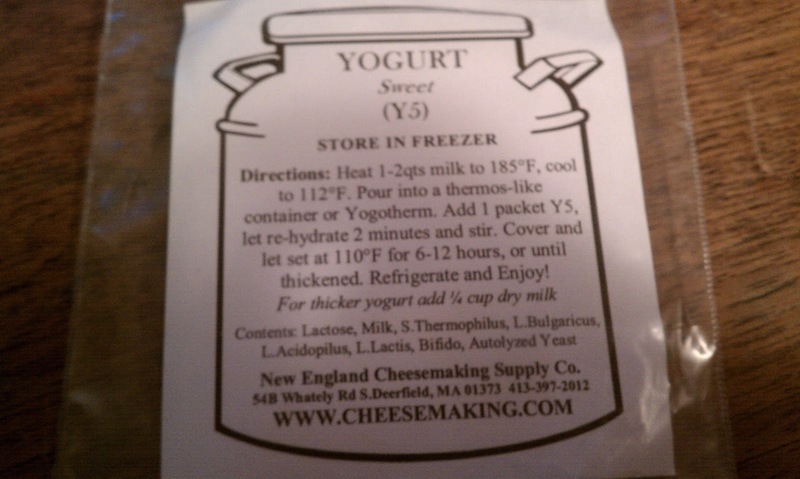 The longer the yogurt incubates, the thicker it will get. 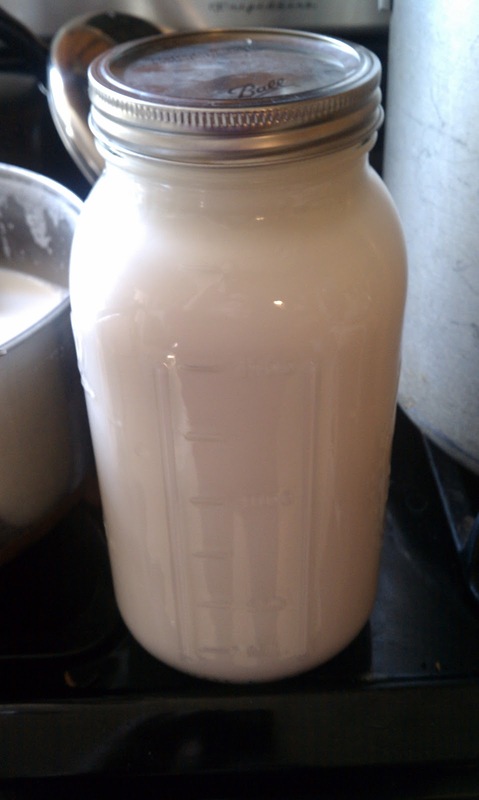 I like it thick, so I keep the yogurt jars in the water bath for a full 12 hours. I believe you can incubate for as little as 5 hours, but 7 seems to be a common number. It's just a matter of preference. Other than the skewer that stands straight up, it's hard to tell the difference between the milk and its new form. But if you were here and I tipped the jar, you would see the difference. Milk doesn't go "glop" like yogurt does. However, I like my yogurt even thicker. Yes, I like the Greek style of yogurt. So my work is not yet done. Now, I get a large bowl and set a colander, lined with cheesecloth, over the bowl. 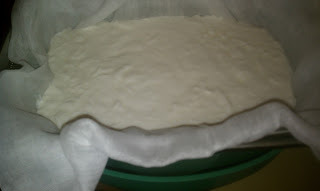 Then I pour one of the jars of yogurt over the cheesecloth. And I stick the whole thing in the fridge, along with the other jar of yogurt. In the morning, I have a colander full of thick, rich Greek-style yogurt, and a bowl full of whey. So here's the final product of my 24 hour project. One half gallon of plain yogurt, one quart of Greek style yogurt, and one quart of whey. Why keep the whey? Because it is packed with protein and adds a really nice tartness to smoothies while it also thins them out a little bit. It has all the same bacteria that is in the yogurt, too. And if you are into grinding your own wheat, I understand that whey is great for soaking the grains. 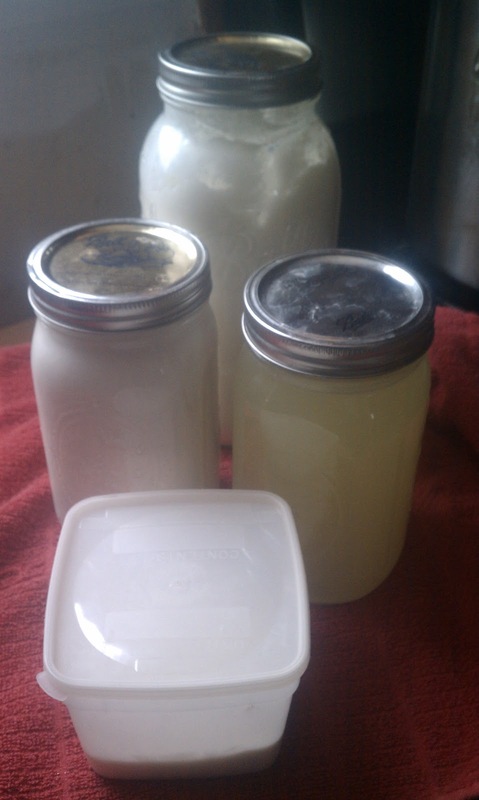 The smaller container in the front there holds about 1/2 cup of the yogurt that I just made. I put that in the freezer so that I can use it as my starter next time. If you make smaller batches of yogurt more often, you can just use the last bit of yogurt from your fridge. I prefer to make more, less often, but the bacteria do become inactive after a while (it seems to last at least a month), so to be on the safe side, I put some in the freezer. The bacteria are like Hans Solo in carbonite. Or something. They will come back kicking once the yogurt is thawed. 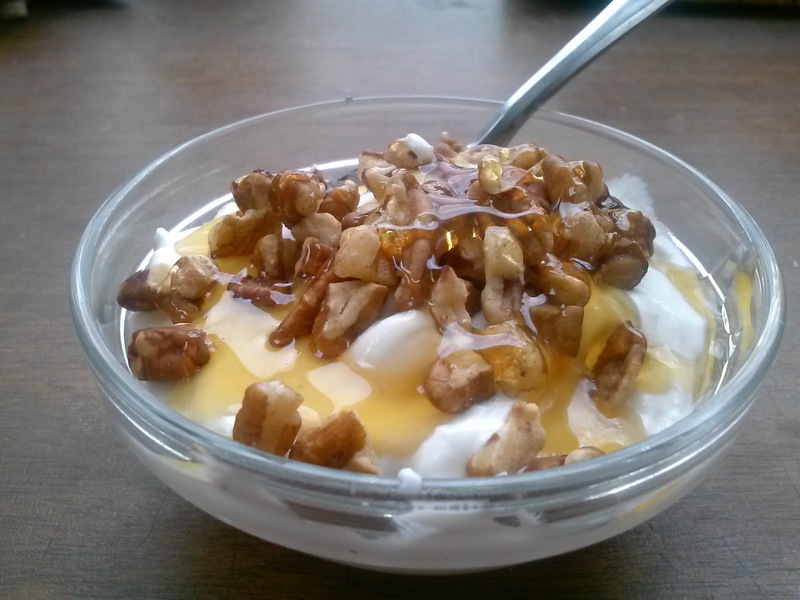 Now, if you love yogurt (especially the Greek-style), you will love making your own. I like to explain in detail for those who don't do a lot of cooking and wouldn't take any steps for granted. 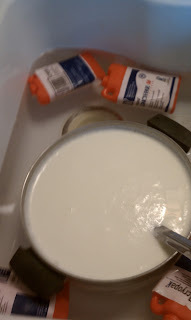 But the truth is that there is about an hour of active time involved in making a gallon of yogurt, and the cost is a little more than the cost of a gallon of milk. Around here, milk is about $3.49 per gallon. That means that it costs about 15 cents for a 5.3 ounce serving of Greek yogurt that you make yourself. I haven't seen those little 5.3 ounce cups at the store that cheap, even on sale, have you? Plus, it tastes better and you get to keep the whey. Definitely a better deal. If you don't love yogurt, make it anyway. I did. And it feels great to stick it to the man. Plus, it turns out that I really do like it, especially sprinkled with chopped pecans and drizzled with a little honey, right before bed. I am a wife and mother in constant confusion. In the field of domestic engineering, I am a classic jack of all trades, master of none. I enjoy exploring new ways of making our house a home, and some of them even work! Tragically disorganized (I welcome all tips! ), I keep trying, day after day, to be the worker at home that God calls me to be. And in the midst of all the craziness of life with three young children, I try not to miss the wonders that are the Fringes of His Ways.